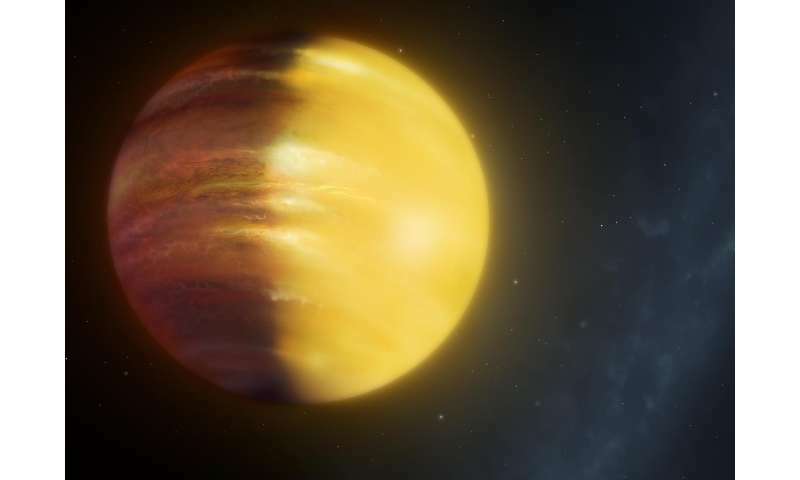 Dr David Armstrong in Warwick's Astrophysics Group has discovered that the gas giant HAT-P-7b is affected by large scale changes in the strong winds moving across the planet, likely leading to catastrophic storms. This shift is caused by an equatorial jet with dramatically variable wind-speeds - at their fastest, pushing vast amounts of cloud across the planet. The clouds themselves would be visually stunning - likely made of up corundum, the mineral which forms rubies and sapphires. The planet could never be inhabitable, due to its likely violent weather systems, and unaccommodating temperatures. One side of the planet always faces the star, because it is tidally locked, and that side remains much hotter than the other - the day side average temperature on HAT-P-7 being 2860K. "Using the NASA Kepler satellite we were able to study light reflected from HAT-P-7b's atmosphere, finding that the atmosphere was changing over time. HAT-P-7b is a tidally locked planet, with the same side always facing its star. We expect clouds to form on the cold night side of the planet, but they would evaporate quickly on the hot dayside. "These results show that strong winds circle the planet, transporting clouds from the night side to the dayside. The winds change speed dramatically, leading to huge cloud formations building up then dying away. This is the first detection of weather on a gas giant planet outside the solar system." First discovered in 2008, HAT-P-7b is 320 parsecs (over 1040 light years) away from us. It is an exoplanet 40% larger than Jupiter and 500 times more massive than the Earth - and orbits a star 50% more massive, and twice as large, as the Sun. The results are published in Nature Astronomy this week. ..as well as posionous atmosphere, crushing gravity, (likely) high radiation levels...oh, and a lack of solid ground to stand on. And that's only the start of it. In fact there is not a single thing about this -or any other- planet out there that would make them human-habitable in anything but the most far-fetched sci-fi scenario. So why bother restating this in every article? Can a gas giant be "Tidally locked?". Are these winds and storms not moving? Is there no bias to their directions? But does the term really fit for a gas giant? Wow. Good question! I am going to guess that it would mean that the rotation and orbital periods are the same, with the rotation period defined as some sort of average for the whole surface. However, like Grallen, I would appreciate further enlightenment if anybody has any. Well, sorta. If you go down into the depths of a gas giant you transition seamlessly between atmosphere and liquid. Mabe there's s solid core. But at those pressures you have immense amounts of friction (and the gas/liquid above has a tendency to become tidally locked with the star at those distances). It would take some immense angular momentum (read: a very large solid core) to stay not tidally locked under those conditions for a significant amount of time. I hear what you are saying, but how would you detect whether such a planet is tidally locked? Surely such effects would be almost impossible to detect at distance. (I refer to the fact that the planet is claimed to be tidally locked in the article). It's hard to talk about rotational period since different bands on gas giants usually have different rotational (angular) velocities. You can see that clearly on Jupiter, and this is also present on Earth, where winds are primarily easterlies around equator and on poles, and primarily westerlies in middle latitudes. And even if it's tidally locked, it is still rotating – with the same angular velocity as it revolves around the star, so there would still be the same Coriolis effects as in an atmosphere of a freely rotating planets, just on different scale. but how would you detect whether such a planet is tidally locked? Surely such effects would be almost impossible to detect at distance. (I refer to the fact that the planet is claimed to be tidally locked in the article). Showman, A. P. & Polvani, L. M. Equatorial Astrophys. J. 738, 71 (2011). I hear what you are saying, but how would you detect whether such a planet is tidally locked? it's based on models (time present in orbit and likely time needed to lock an object.) The closer and more 'gaseous' an object is the faster it will be tidally locked. i asked: [regarding knowing if a gas giant is tidally locked] is there another method other than models? I wish! Unfortunately, not really. The current generation of telescopes isn't quite powerful enough to spatially resolve the atmosphere of a planet while also being sensitive enough to pick up the variations in that would indicate superwinds. Mostly, the best we can do is one or the other, get a few baseline measurements of the dayside, nightside, and perhaps the transition between them, and use them as guidelines for theoretical models, which get better and better every day.